Optimum effectiveness of high performance coatings is highly dependent on the preparation of the surface prior to application of the coatings. Superior results are achieved when the items to be coated are first prepared properly by degreasing with alkaline degreaser and then zinc phosphate is used as a final preparation. It is inexpensive and helps to achieve better performance. 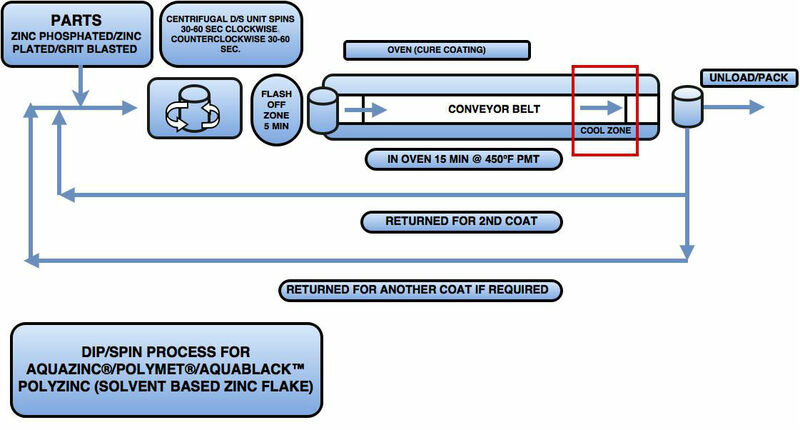 Polymet®, Polymet-Seal® and Aquazinc® products can be applied with non-electrolytically applied dip spin coating techniques for mass produced hardware parts and by spray application with or without electrostatic for larger metal parts. Product is placed in a mesh basket, submerged in Polymet® coating solution and spun to remove the excess coating. The temperature and viscosity of the coating, immersion time, spin direction and velocities, and the cure method are among the variables that allow users to customize a process recipe and achieve precise, highly repeatable results. Aquazinc®/ Polymet® coatings can be spray applied with regular spray technique and also with HVLP spray equipment with better efficiency. The coated parts need to cure at around 200 degrees Celsius for polymerization. The SST results and other chemical related properties vary if the baking cycle is not being performed properly.